Gibson High Performance Superflow Mufflers deliver the powerful "big block" sound at the tailpipe with more usable pulling power and torque! Gibson�s superior design reduces cab noise (drone) without sacrificing power or sound quality . By baffling and chambering their mufflers, (vs cheaper packed or screened mufflers - nothing to blow out) Gibson mufflers promote better volume efficiency with unrestricted flow. 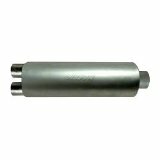 Even better, the added thickness of the muffler case and heavy duty tubing, along with a superior stainless steel design, all contribute to a long and productive life for your new performance muffler.